Create the detailed report with web analytics data of your website in a few minutes. Semalt specialists have provided all the necessary features and configurations the user will need to monitor their website statistics. It takes only a few minutes to generate the detailed report. Get the ready reports anytime you need. Choose project. In the field Search enter the name of your project or select it from the drop-down list. Export format. Select the export format of your report: .PDF and .CSV. In order to change these data, select Add new template in the drop-down menu. Upload an image with your logo, add text for the footer and your company name. Recommended logo resolution: 720*200 pixels in .JPG and .PNG formats. Choose the report delivery frequency: daily; weekly; monthly. Enter the delivery template name. Create the report delivery list by clicking the button Add contact. Please enter a valid email address! The user details specified on the registration are displayed in the field Send to contact in the Default template. According to the default schedule the reports will be sent to your email every day. Choose one of the formats: .PDF or .CSV and select the design of your report: SEMALT label or White label. The example of scheduled report will be sent to your email. Go to your email account to view it. Open the message from the Semalt Report Center. You can download the report to your hard drive. If you need confirmation, click “Confirm report delivery to contacts” once you check the data. You will see the delivery status message on the Semalt page: Successfully sent to the contact(s). Here you can see the list of selected contacts. 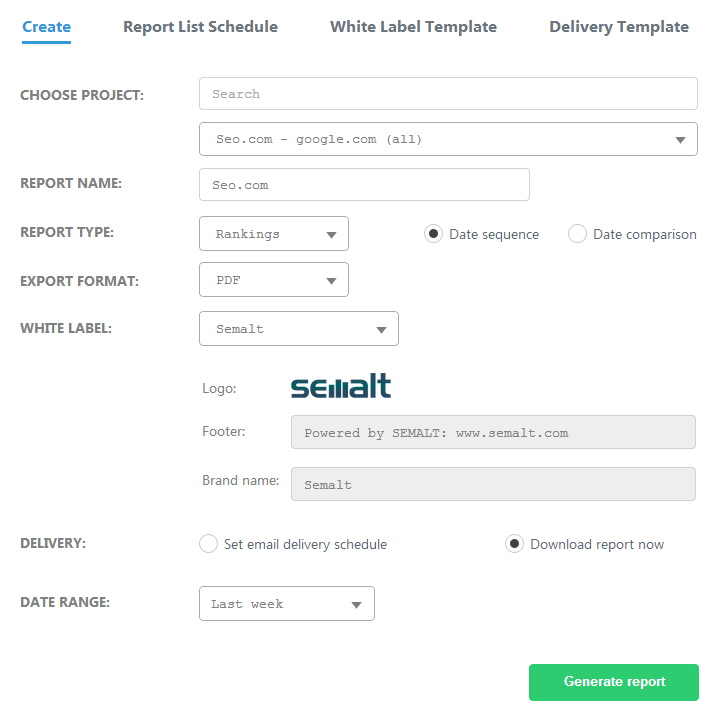 In order to cancel the current report delivery template, click the button Disable report delivery in the Semalt Report Center message and deactivate the current template on the page Report List Schedule. Read more information in the section Report list. Everything is ready to get web analytics reports for the selected date range and to download it to the hard drive. Click the button Generate report to finish the report generation procedure. Using web statistics reports you can analyze the efficiency of your website optimization and marketing campaigns. 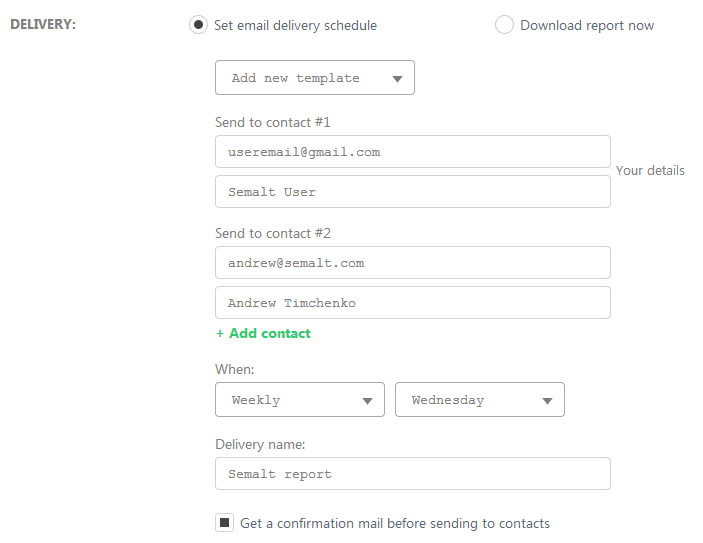 Configure the template only once and get regular reports to the email. When you select Download report now, specify the destination path to save the document. Can I create several report templates for one project? You can create unlimited number of templates for each project. I want to get reports to other email address. 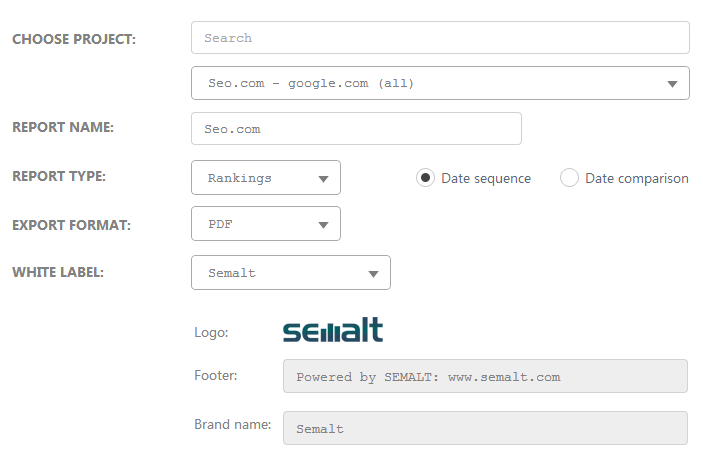 Do I have to change my email in the Semalt account settings? No, you don’t. Select Add new template in the field DELIVERY and enter a new email. I don’t receive any Semalt reports. Why? Please, make sure you specified the valid email. If you have some difficulties with web analytics reports, please contact our user support service.